A portable powerhouse, the HALO Bolt charger provides the juice when you need it most--not only for your phone, tablet, and other handheld devices, but also for your car. At the push of a button this portable charger, compact and refined, can jump start a car, boat, or lawn mower with included jumper cables. Once you're on the road, the HALO Bolt's two USB outputs allow you to charge multiple devices at once, so you can power up your smartphone while your kids stay busy with their charged tablets. There's even a 120-volt AC wall outlet so you can charge your laptop. With features like a convenient LED flood light, customers frequently rely on the Bolt as a power source during power outages to keep their electronic devices charged. Size: 7.2" x 3.8" x 1.6"
HALO designs, develops and markets clever, innovative technology products to make consumers' lives easier while delivering reliability and portability with high style design. Offering a wide array of consumer electronic products including a proprietary portable car jump and a plethora of novel portable chargers capable of powering everything from phones to laptops. HALO continues to be a global leading force committed to offering products at the nexus of fashion and function created to power your life. Phone, Tablet, and USB Power Bank - Never run out of battery! 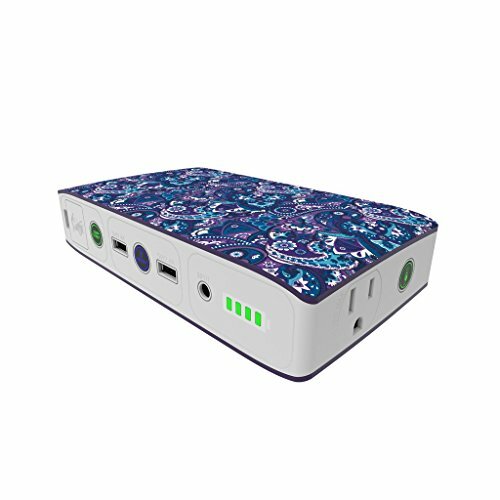 Two USB 2.4V charging outputs means this iPhone, Samsung Galaxy, or iPad Portable Charger powers multiple devices at once. Universal Laptop Charger - Keep your Mac, PC, phone or tablet charged when traveling or use as a backup during a storm. 120V AC wall outlet powers your laptop on the go. Enough charge for 7.9 hours of battery life for a 13.3" Macbook Pro, 8.6 hours of iPad Air surfing, 19.9 hours on an iPad Mini, or 62.7 hours of talk time on an iPhone 7. See picture chart for details. Stylish and Safe - Every portable charger has a fashion forward design, bringing safety back. Choose from Paisley, Floral, and Graphite patterns plus more. Everyone picks their flavor with this compact unit.